Although babies start out perfectly content to snuggle up to nurse or take a bottle, it isn't long before they are sitting up to take their meals. Shops offer a wide variety of options for highchairs and boosters, so choosing the best one can be a bit overwhelming. It can help to take a quick look at some of the many choices available. Several manufacturers offer helpful products to hold and support even young babies. Typically referred to as feeding chairs, these baby seats often offer several seating positions which can be especially useful for young babies who are not quite ready to sit fully upright. When adjusted to a semi-reclined position, feeding chairs can allow parents to keep babies near them during family meals so that their baby learns to enjoy the socialisation even before they are eating solid foods. By the time that babies are eating from a spoon, they'll need to have their own safe chair in which to sit for meals. Most parents choose some version of a traditional highchair, although the choices increase every year. Highchairs are now available in a wide variety of styles, so there will certainly be one designed to blend with any decor. Virtually all highchairs currently being produced by major manufacturers are supplied with safety straps that should be used every time that a baby is placed in the chair. Additionally, babies should never be left unattended while in their highchairs, since a fall could result in serious injury. All babies should be supervised when eating too, to minimise the chances of choking. Once babies have outgrown their highchairs, they are usually ready to graduate to booster chairs. Boosters are typically placed on top of regular sized adult chairs to allow older babies and toddlers to eat directly at the table with the rest of the family. Many babies really enjoy the interaction of being a part of regular family meals and parents typically enjoy this stage too. Eating together allows parents their first opportunity to begin teaching good table manners, although it will certainly take a number of years to turn little people who eat with their fingers into well mannered ladies and gentlemen who chew with their mouths closed and keep their elbows off of the table! 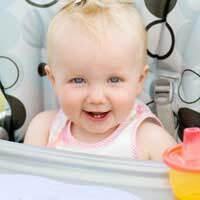 When choosing a feeding chair, whether it is a highchair or a booster, safety is the most important factor. Look for well constructed pieces that are equipped with safety belts. If using a borrowed highchair or one that was handed down, do a quick internet search to be sure that the product hasn't been recalled by the manufacturer. After safety, all other factors are merely matters of preference. Styles to coordinate with kitchen decor are nice, as are space saving models for small houses and flats. When looking for a highchair or booster, do a little comparison shopping to be sure that you are getting the best possible price. The money that you save will come in handy for jars of strained peas and pears!